EXCLUSIVE: Music Industry’s Next Big Star Peyton McMahon Sits Down with Celebuzz! In 2015, the up-and-coming musician Peyton McMahon realized his dream when he was invited on stage by his idol Kelly Clarkson to perform in front of thousands of people. She picked him out of every other artist in the world to open up for her because she loved his cover songs. Peyton found viral fame because of his song cover videos over the past few years, but he wants people to hear what he has to say through his own music now. Peyton is set to take over the Billboard charts with his new E.P., and he spoke to Celebuzz! about his album, his songwriting process, and how American Idol indirectly influenced his life. CB: Could you tell me about your musical journey in general. What got you started, and where you are now? Peyton: Since I was a kid, I’ve been super into music. My grandmother taught piano lessons when I was little, and when I was six I started taking lessons from her. I like to play by ear, and we got frustrated with each other. So I stopped taking lessons and started teaching myself a little bit. I started playing guitar when I was 11 and singing. I always loved to sing, but I was always way too scared to do it in front of anybody until I went to Disney World when I was 16. They just opened up this American Idol experience attraction. I just took a big leap of faith and auditioned for that, winning the whole day. After that I just kept that going, kept playing in bands with friends. A few years later, I started a YouTube channel, and here I am now. I just released my first EP. CB: How did you manage to get over that stage fright? I know that that’s an issue a lot of people suffer with. Peyton: Yeah it was tough. It was telling myself if I ever wanted my dream to happen, I’ve got to make myself get over it. At the time, I was obsessed with American Idol. I loved the fact that they had the whole stage and the whole setting at Disney World, and made it really intrinsically made me want to do it. I gave it a try and realized that there’s really nothing to be scared of. Then around 2012, I started posting my own interpretations of popular songs on YouTube and had some artists like The Vamps, Fifth Harmony, Matchbox 20, and Shakira watch and share my covers to their followers. OneRepublic picked my cover of “Counting Stars” as one of their five favorites, and I was in two different Ryan Seacrest “Best Cover” contests that had weekly rounds of fan voting over the course of like two months. I got second in a contest for the best cover of “Team” by Lorde and Top 5 in best cover of “Shake It Off” by Taylor Swift. CB: Do you do all of your own writing? Peyton: I do. All of the songs on this E.P. I wrote by myself. I mean I’m totally open to co-writing, but just for whatever reason I write by myself. I haven’t really had much of an opportunity to write with people yet. CB: I have heard of this awesome Kelly Clarkson story. I would love it if you could just tell me all about that, how you got in touch with her, how you came to open up for her at her show in Dallas. Peyton: I’ve always been a fan of hers. I watched her on American Idol and have been listening to her ever since. I’ve tweeted her a couple of my YouTube covers. Her tour wasn’t coming really close to me; the closest show was Dallas. And the night before that show which I wasn’t even planning on going to, her musical director emailed me and said that Kelly wanted me to perform the next night. The next morning, I immediately drove into Dallas and got there in time to soundcheck and rehearse with her band who was incredible. In the middle of her set, she introduced me, and I came out and played a song with her band. Afterwards, I came back out, and she chatted with me in front of the crowd. It was incredible. CB: It’s unbelievable that you went from being a person who nearly held themselves back from stage fright to performing on a giant stage before Kelly Clarkson. I want to hear about your self-titled E.P that you just released on December 22nd. Peyton: I’ve been writing songs since I was like 10 or 11, and I always was wanting to release original music but was waiting until I had a handful of songs that I felt comfortable and confident to be pushing and investing in. 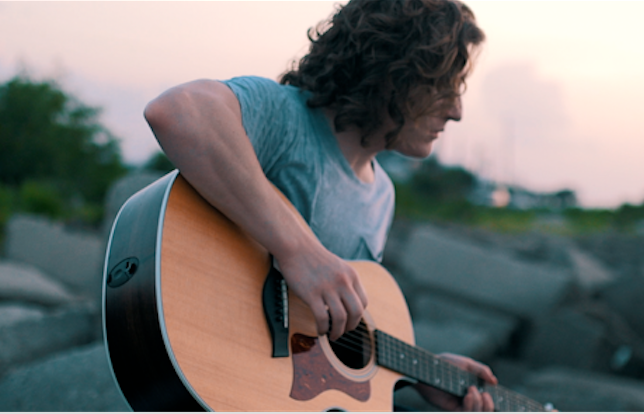 I just ended up coming up with these four songs that were all a little bit different but all kind of were about what I was feeling at the moment, and still am, about chasing a dream and the different emotions that are associated with kind of taking that dream. I sent the acoustic demos to my friend David who plays keys on tour for Gavin Degraw and a couple other artists, but he produces on the side is super talented. Sent him acoustic demos of that, and he was down to produce it. I flew out to L.A. with him and recorded all the vocals in the studio with him in two days and after that he kept working on the tracks. We were sending them back and forth to each other, constructing them, and he got a few other band members to record instruments on it. Finally it came into fruition. A little bit of an unconventional process, but I’m happy with how it came out. CB: That’s awesome. So you have just released this E.P., but what can we expect from you in the near future? Peyton: In the near future I’m definitely going to be doing a lot more to promote it and get the word out, performing a lot more, and definitely writing a lot more. I’ve been writing new stuff that I’m really excited about that I hope to get in the studio at some point this year and record the follow-up to this E.P. You can get more details about Peyton on his website. 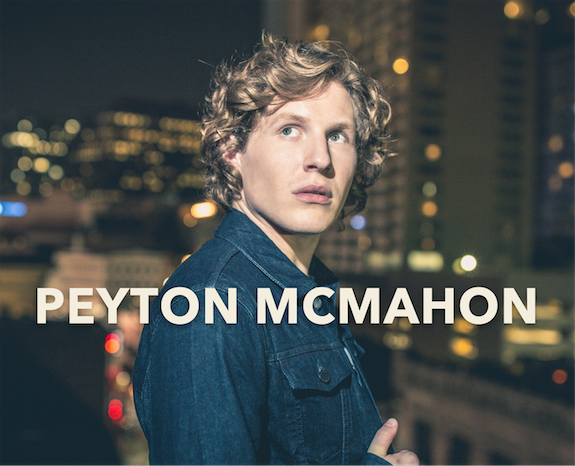 Tell us what your favorite Peyton McMahon cover song is in the comments and SHARE this story!